Spring may be one of the happiest times of year, which is dreadful for those of us who like being sad. 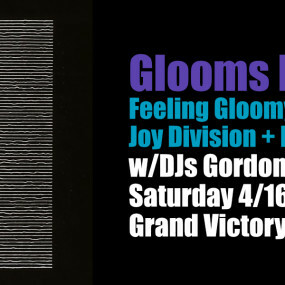 So, we’re marking the occasion by throwing a party themed after one of the most depressing bands of all time: Joy Division. Ok, so perhaps New Order actually might sound kind of Spring-y at times, we’ll overlook it, and we’ll throw them into the mix too. You could even say that the saga of Joy Division and New Order is one of death, rebirth and retribution, much like the renewal of life in the Spring, as innumerable shaggy pagans have foretold while stroking their overlarge beards and clasping onto oaken staves, or something equally wooden. But that’d be ridiculous. We just happen to like these bands. We decided the game of Twister wasn’t gloomy enough, so we’ve redesigned it with a little extra Joy Division oomph. Just imagine! “Left foot black. Right hand dark gray. Left foot very dark gray!” In retrospect, it might prove to be a bit more challenging than usual. Did you come to our long-ago Ian Curtis birthday party? Our gloomy cake master Evelyn made this crazy Joy Division-themed cake that was quite an (unknown) pleasure, and we’re bringing it back for yet another round. Might even pop some birthday candles on there for the birthday girl, but even if you don’t know her you can still have some cake. As we do each and every month, Gordon and Nathaniel, the brothers Gloom, will inspire you with the best in depressing yet danceable ditties. For the occasion we’ll be mining extra helpings of deep cuts from our Joy Division and New Order collections (and probably a bit of Electronic and Revenge as well), but also bringing you the best anglophilic gloomy anthems that millions of sad hours in record stores can buy.